1. Cook orzo pasta according to package directions. Drain the orzo and rinse with cold water to stop the cooking and to wash away some of the starches. Allow the pasta to cool. 2. 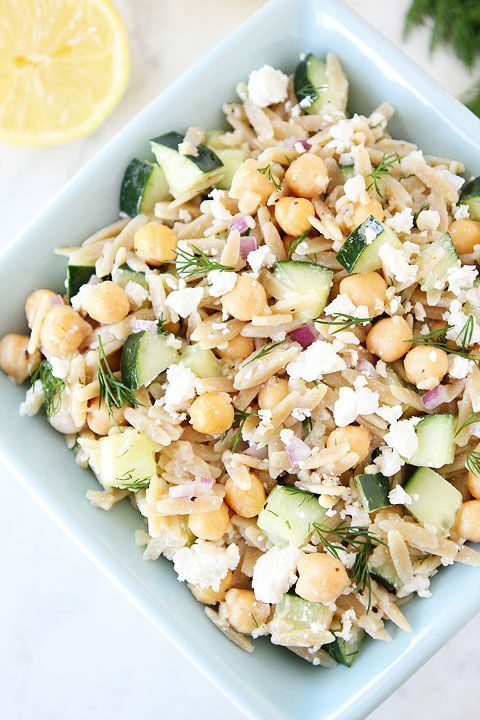 In a large bowl, combine orzo, chickpeas, cucumbers, feta, dill, and red onion. 3. In a small bowl, whisk together olive oil, lemon juice, garlic, dill, salt, and pepper. Drizzle over salad and stir until ingredients are well coated. Serve immediately or chilled.